The cost of your orthodontic treatment may vary depending on your individual needs and treatment plan. 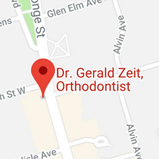 During your visit, we'll discuss with you the cost of your treatment, and each of your available payment plan options, so that you are able to make the best choice for you and your smile. We will work with you to try to create a payment plan that fits your budget and you will know what to expect before beginning treatment. Our office staff is always available to help you with insurance claims and paperwork. We’ll provide you with the CAO/CLHIA approved forms and make every effort to help you understand your insurance benefits. Electronic submission of insurance claims for orthodontic benefits is not currently approved in Canada. Although you may be used to using this method at your dentist's office, we are unfortunately unable to offer this service at the present time. Our practice accepts most major credit cards. Payment may also be made by debit card or you are invited to leave a series of post dated cheques for monthly deposit. Full details of our financial policies are available upon request.